No matter how popular this is, no matter how many box office records it broke in its first week of release, this is super-lame. Sure, there’s over the top action scenes and non-stop digital madness, but this is so aimed at teen and pre-teen boys (and a few girls), that trying to view this without gearing down and placing yourself into a zit-faced kid’s mind frame is very hard. The Fallen is preparing to rise and crush mankind, but the last Optimus needs to be defeated to enable this. Sam is heading for college, putting a strain on his relationship with Mikaela. When things erupt, it is Sam who needs to side with his transforming giant robot friends to save the planet, since the government has ordered these protectors to stand down, believing their presence is not keeping mankind safe, but drawing the rouge Decepticon elements here, causing havoc. 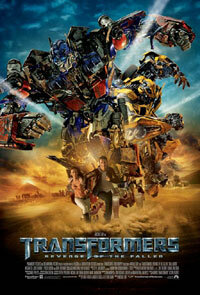 The special FX team certainly worked overtime and the barrage of robot action can saturate those not prepared for it. That said, the absolutely annoying characters and their often ridiculous lines and moronic actions make this very hard to watch, the stupid jokes and often atrocious lines and sight-gags just too much. So, if you’re young at heart, enjoy vacuous big budget digitally-driven entertainment, and have two hours of your life to waste, this movie is for you.